People continue to lead longer and fuller lives - and it appears men are catching up with women when it comes to life expectancy rates. Figures from the Office for National Statistics (ONS) show men can now expect to live until 79 while women can hope to reach 83. Advances in medical treatments are said to be part of the reason why people are enjoying longer lives. The data also reveals life expectancy at birth has increased by almost three years per decade over the last 100 years. Men born in 1910/12 across England and Wales were expected to live to 51. Now they will likely live to see 79. Among women, life expectancy has jumped from 55 to 83 during the same period. In addition to the better treatment of illness in old age, the ONS also attributes the change to falling death rates among babies and children. People aged 60 could expect to live around nine years longer in 2010/12, compared to 100 years earlier. With life expectancy constantly getting higher, people have more time to travel the world in their retirement. Whether it is the trip of a lifetime, taking in multiple continents over several months, or just a week on a beach somewhere, seniors travel insurance lets the over-60s venture abroad, knowing they are covered for any eventuality. 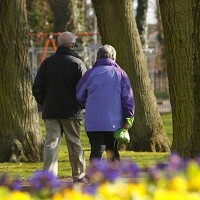 But an ageing population brings with it a number of challenges, particularly regarding care. Andrew Kaye, head of policy and campaigns at Independent Age, says the country's ageing population is one of the most important issues facing society, putting an enormous strain on the care system. If the UK is to be the best place to grow old in, he claims an honest debate is needed about what kind of health, social, housing and transport services the older population wants - and how much society is willing to pay for them.